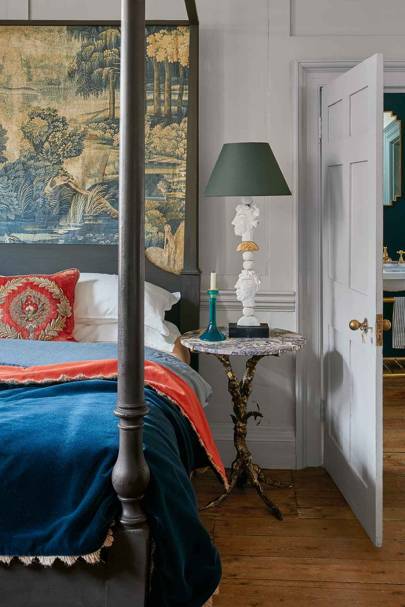 Every month House & Garden’s decoration editors curate a fictional, shoppable home, using a painstakingly researched selection of beautiful objects old and new. Welcome to The Scheme. 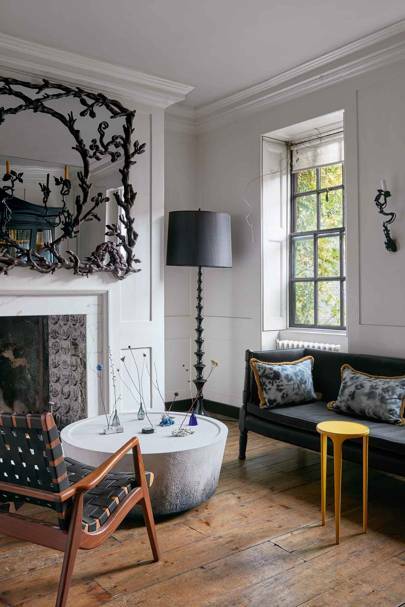 This month Gabby Deeming creates moody interiors using grey and gold for the artist Marianna Kennedy’s east London house. 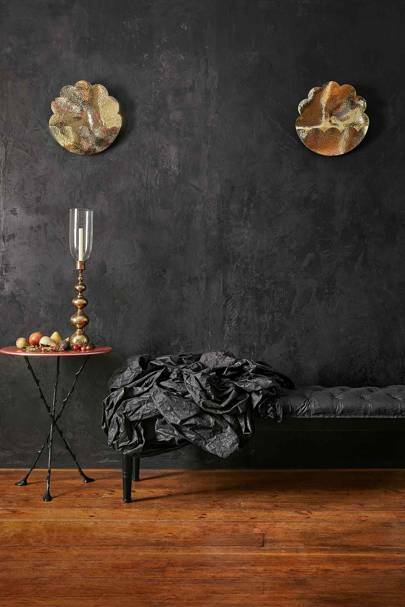 • Plaster wall panels, £2,640 each, from Cox London. • Brass ‘Scalloped Helios Lights’, £1,950 each, from Soane. • ‘Gueridon’ bronze and lacquer side table, by Pedro da Costa Felgueiras and Marianna Kennedy, £18,000, from Marianna Kennedy. • Ebonised beech and textile ‘Indigo Bench’, by James Plumb, £21,600, from Gallery Fumi. • Brass and glass ‘Basil Hurricane Lamp’, £1,800, from Cox London. • Wax fruits, from £8 each, from Beedell Coram. • ‘Verdure with Birds’ linen wall hanging, by Zardi & Zardi, £640, from Watts of Westminster. • ‘Augustus’ mirror (just seen in bathroom), £1,560, from Balineum. • Bespoke hardwood four-poster bed, from £5,490, from TurnPost. • ‘Vine Root’ bronze and blue stone side table, £9194.40, from Cox London. • ‘Gotham’ brass washstand (in bathroom), £1,999; ceramic undermounted basin, £340; Calacatta marble top, £1,575; all from Balineum. • Pre-washed bedlinen, from £48 for a pillowcase, from Larusi. • Bed throw fabric, ‘Mohair’, £190, from Amy Somerville; trimmed with ‘Fan Edge’, jute, £55, from Samuel & Sons. • ‘Rossini’ embroidered silk velvet and metallic thread cushion, £1,950, from Beaumont & Fletcher. • Polished resin candlestick, £120, from Marianna Kennedy. • ‘New York’ resin, slate and gold leaf lamp, £950, from Margit Wittig; with ‘Bookcloth’ shade, £90, from Marianna Kennedy. • ‘Easton Vintage ‘ brass deck-mounted tap, £1,124.40, from Waterworks. • Linen hand towel, from £8.99 a pair, from LinenMe. • Emblem oil paintings, from £2,500 each, from Marianna Kennedy. 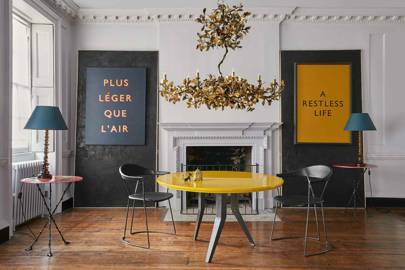 • ‘Gueridon’ bronze and lacquer side tables, £18,000 each; iron and lacquer table (yellow), £14,500; both by Pedro da Costa Felgueiras and Marianna Kennedy, from Marianna Kennedy. • Leather and steel ‘Y Chairs’, £4,200 each, from Rose Uniacke. • ‘Spring’ resin table lamps, with ‘Bookcloth Shades’, £495 each, from Marianna Kennedy. • Brass ‘Golden Oak Chandelier’, £15,600, from Cox London. • Similar ornaments (on table), from a selection, from Fisher London. • Similar mirror made to order, by Marianna Kennedy, from Galerie Chastel-Maréchal. • Similar bronze wall light made to order, from Marianna Kennedy. • ‘Smilow’ leather and walnut armchair £7,200, from Mint. • ‘Nim’ Jesmonite coffee table, £4,850, from Pinch. • Similar sofa ‘Temple House’, £7,500, from Virginia White Collection. • ‘Wisp’ metal and leather side table, £1,044, from Ochre. • ‘Strato’, linen mix, £65, from Designers Guild; trimmed with ‘Saisons Brush Fringe’, £29, from Samuel & Sons. • Ceramic and glass stem holders, from £55 each, from Rosa Nguyen. • ‘Tulip’ gessoed wood standard lamp, £2,650 including horsehair shade, from Marianna Kennedy. 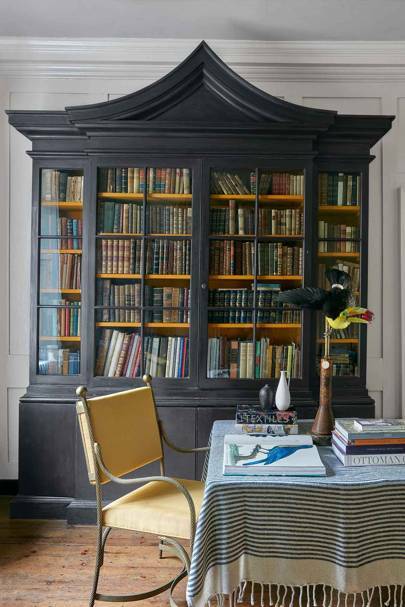 • Similar bookcase made to order, from £13,500, from Coryndon Cabinet Makers. • ‘Rope Arm’ upholstered metal chair, £1,800, from Talisman. • Wool-mix throw (used as tablecloth), £156, from Larusi. • Earthenware ‘Small Vase’, £195; ‘White Porcelain Vase’, £180; both by Kenta Anzai, from Maud & Mabel. ← When Is the Timing Perfect for a Price Reduction? October 26, 2015 admin Comments Off on Is Your Credit Score Good Enough to Get a Better Mortgage?